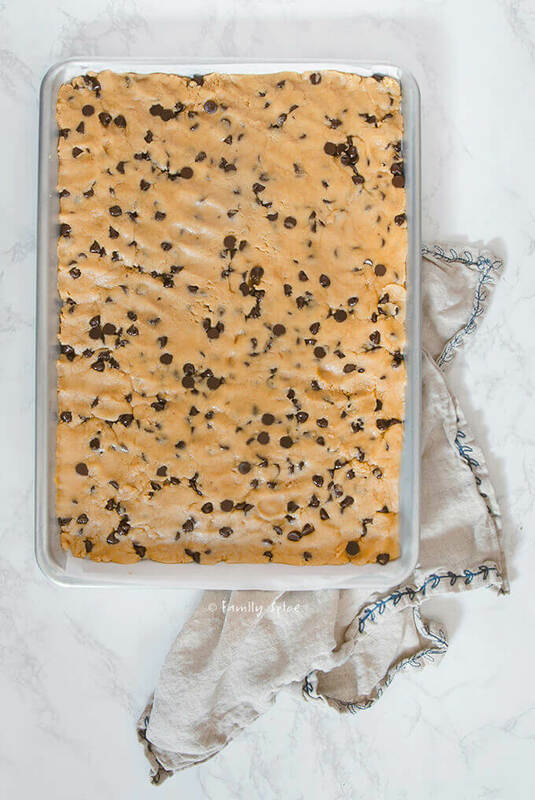 Whether you are baking for a crowd or need to make a large batch of cookies fast, these sheet pan chocolate chip cookie bars are the perfect treat, and made with olive oil, too! It seems like I am always entertaining. Whether it’s a small family dinner for 20 or a big birthday bash for 40, I am always in the kitchen. I don’t mind, really. I love cooking for my peeps. And I especially love mixing in new recipes along with the family favorites, like my good-with-any-fruit yogurt cake! But that doesn’t mean I am not looking easy fixes or ways to make the entertaining go smoothly. That’s what make these sheet pan chocolate chip cookie bars so ridiculously awesome. Everyone loves the classic chocolate chip cookie. And these babies are so crazy easy to whip up. This is not a complicated recipe to follow. To make these chocolate chip cookie bars chewy and moist, I have used 3 types of sweeteners: granulated sugar, brown sugar and maple syrup. I personally prefer dark chocolate chips, but feel free to use semisweet or any chocolate chip varieties that you prefer. The fat base I use for these chocolate chip cookie bars is NOT butter, but, you guessed it, extra virgin olive oil. This might be blasphemous for some bakers, but I have already professed to you my love of baking with olive oil. Butter has it’s place in baking, for sure, but you won’t miss it in these cookie bars. Because I use olive oil instead of butter, my baby nephew who is allergic to dairy can enjoy these cookies. 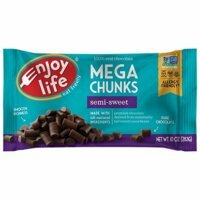 For his personal batch, I usually use these allergy free chocolate chips. 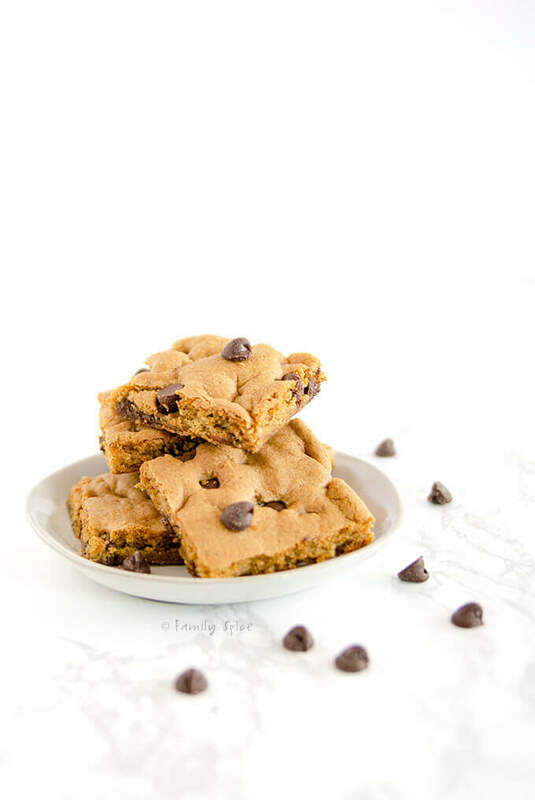 So you see, being dairy free isn’t a bad thing and it certainly doesn’t mean that these chocolate chip cookie bars are flavor free. Is it a chocolate chip cookie or a chocolate chip cookie bar? When I was trying to figure out what to name these treats, I wasn’t sure what to exactly call them. I’m sure I could drop dollops of batter on the baking sheet and bake these up like regular chocolate chip cookies. But, when you’re cooking for a crowd, it’s all about quick and easy. Simply whip up the batter and spread it over an 11×17 baking sheet. The cookies do puff and spread a bit, but do press the batter out as close to the sheet pan walls. If you want a thicker batter, you can use a small pan. You can also halve the recipe, press the cookie dough onto a 9-inch pizza pan to bake one large chocolate chip cookie. If you use a 9-inch cookie pan, press the batter up to about 1/2 to 1-inch from the edge of the pan. 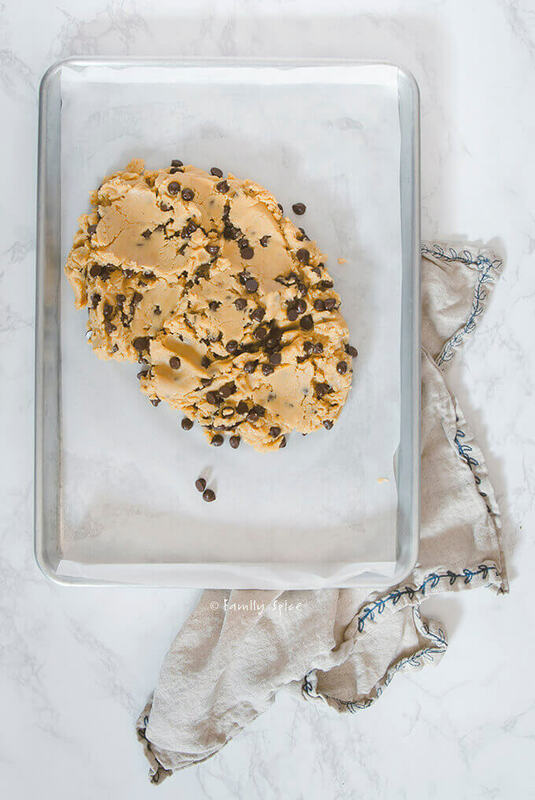 The beauty of baking up these sheet pan chocolate chip cookie bars is that you can cut them to any size you want. From small to large, the choice is really up to you. 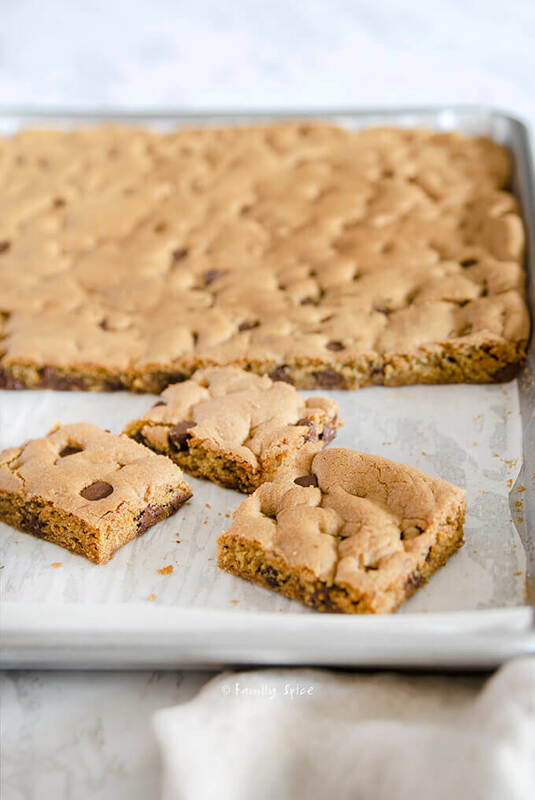 I mean, some of you might look at these sheet pan covered from every inch with delightful chocolate chip cookie and think, that’s one serving! Am I right?! 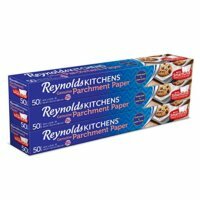 But seriously, if you cut these into 1-inch squares, you will have 187 cookies. Cut them into any shape and size you want. No matter how many times I try to cut these evenly just by eye-balling it, I usually have a variety of sizes. Feel free to use a ruler to keep the cookies even. And to keep the kids from going to war over that oblong large cookie bar. How long will the chocolate chip cookie bars last? 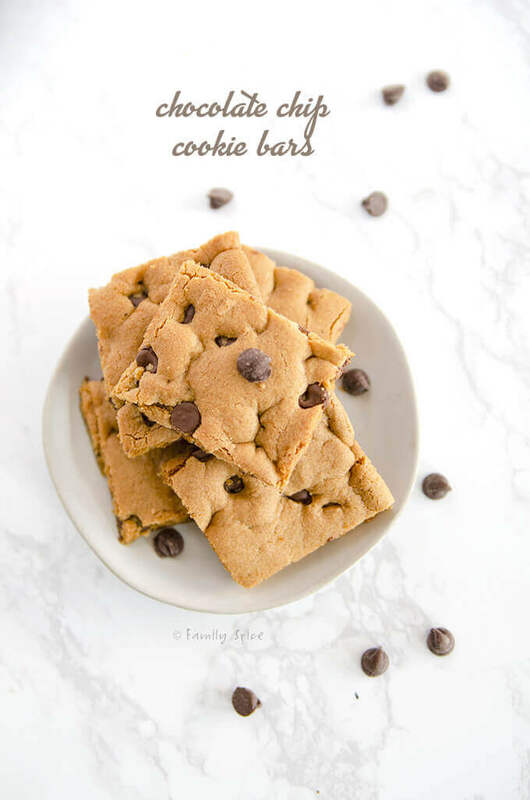 Well, if your friends and family don’t inhale these cookies in a day or two, these chocolate chip cookie bars should last in a sealed container for 5-7 days. But seriously, they will totally get devoured well before they go bad. Do you have a gluten free chocolate chip cookie bar option? If you like a thicker bar that is also gluten free, try my Paleo Chocolate Chip Cookie Bars. They are made with almond meal, making them very filling, high in protein, and of course, gluten free. And may I add, they are also very kid friendly. 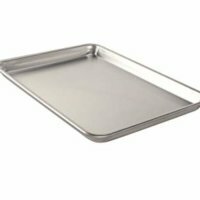 Coat an 11x17-inch baking sheet with oil and line with parchment paper. In a large mixing bowl, whisk together olive oil, maple syrup and sugars until sugars have dissolved. Mix in eggs and vanilla extract until fluffy. Using a rubber scraper or spoon, mix in flour, baking soda and salt until just combined. 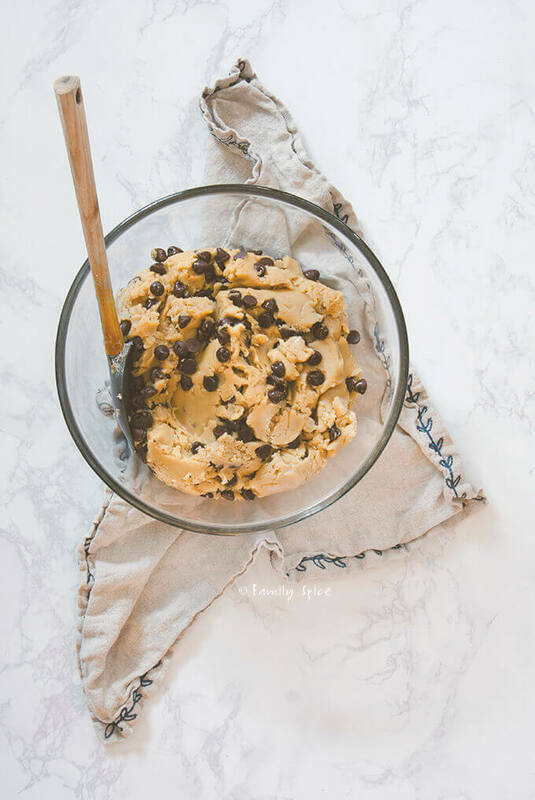 Dump cookie dough onto prepared pan and press smoothly to the edges of the pan. Start with the rubber scraper, but clean hands and fingers work much better for this step. Bake for 15-20 minutes, then set aside on a cooling rack to rest. Cookies are best cut at room temperature. Thank You, printed it and will try. Great recipe to have with a house full of teenage boys! Lol this is definitely perfect for hungry teenagers!! Enjoy! 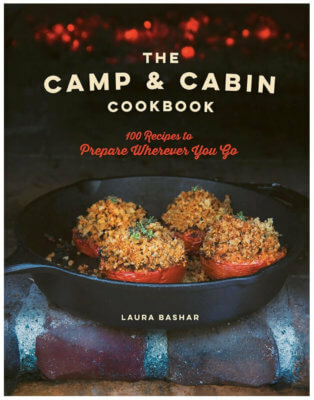 Hi Laura – I thoroughly enjoyed making and eating these cookies but noticed that you did not mention the “maple syrup” in the instructions. I assume you mix this in with the other sugars. Ack! Yes, thank you. You mix in the maple syrup with the rest of the sugars. So happy you enjoyed the cookies. I’m actually making another batch this weekend.